This is a version of the Franz Josef Land map in oblique orthographic projection. 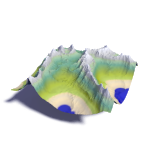 It is produced using the same data and the same generalization and map rendering techniques as the normal map. 3d rendering is done using POV-Ray. More details on orthographic 3d maps can be found in this blog post.